This article is part 4 of an ongoing series that The Costa Rica Star will be publishing with writer and photographer Scott Alexander, chronicling the best places to visit and sights to see up and down the Pacific coast of Costa Rica, over a 12 day period. The following is what happens when an outgoing girl from Miami Florida meets up with her friend here in Costa Rica, and together they go on an adventure of a lifetime. As I was getting coffee on our second morning in Tamarindo, Myriam (the co-owner of Hotel Luamey where we were staying) asked me if the howler monkeys had woken me up. They had been loud that morning, she said. I didn’t hear them. As with almost every other single morning since being in Costa Rica, I woke early because of my shifted internal clock. I don’t know if it’s because it starts getting light at five in the morning in Costa Rica or if it’s something else, but since being in this country, I now wake up between the hours of five and seven in the morning. The mornings when I wake before five o’clock, I question my earlier desire when I lived in the States to have more hours in the day. Don’t get me wrong: I love mornings and sunrise. I just wish they happened a little later in the day. When Priscila woke up, I told her about the howlers, keeping my enthusiasm and talky-talkyness in check as is necessary when engaging in conversation with someone who hasn’t yet had coffee. (My first wife hurled a coffee pot at my head the very first morning after we were married. I’ve been mindful of people’s coffee levels ever since. Also, their batshit crazy levels.) But I knew spotting monkeys was on Priscila’s to-do list for her time in Costa Rica and I had not yet seen this species. So the day was off to a promising start. Over a light and delicious breakfast, we talked about our plans for the day. Today would be a vacation day mostly. Priscila only wanted to go to the beach. 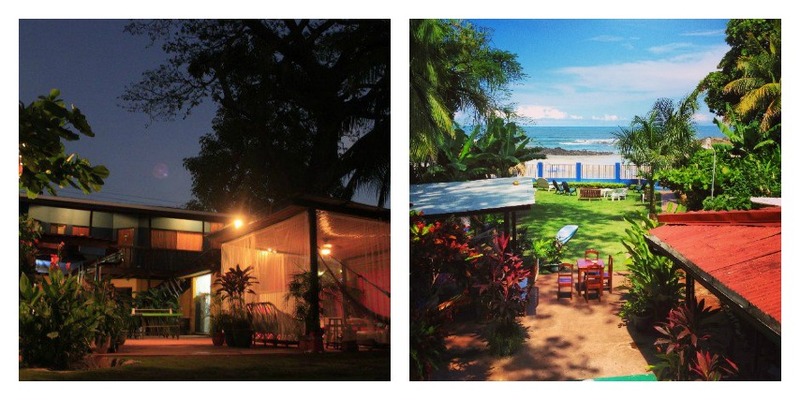 I’d take care of a little business beforehand and then we’d be off for a full day of relaxation in Tamarindo. We had scheduled surfing lessons with Witch’s Rock for late that afternoon and then she would be doing yoga afterwards, but for the most part, this was going to be a day of doing absolutely nothing. From the beginning, Priscila and I were pretty much winging it on this trip, both for how we were going to travel around the country and for where we were going to stay. Priscila had compiled a list of beach towns she wanted to visit ahead of time and, before her arrival, I had made some tentative reservations in those locales. But because our schedule would be pretty fluid (for example, we hadn’t even planned on being in Tamarindo more than one night), we mostly figured out our lodgings and travel along the way. Since it was the height of rainy season, getting accommodations at the last minute shouldn’t be too difficult, I had reasoned. So before we left the hotel that morning, in addition to processing photos, I was working to finalize where we would be staying in Nosara, the town we would be traveling to the following day. As for how we would get there, that was still up in the air. After a while, and with zero plans at all solidified, it was time for the beach. As we walked toward the beach, we came upon people waiting at the bus stop. Naturally, Priscila struck up a conversation with one of the Ticos and began collecting route and schedule information (we would have to go to Santa Cruz, down to Nicoya, then back over to Nosara). As we stood there talking, the next bus came and the driver got off for a break. The driver confirmed for us the route and it looked like the trip to our next destination, if we went by bus, would be an incredibly long one. Hours upon hours in the bus. Priscila wasn’t feeling all that terrific and so we would have to think about this. Back on track, we walked toward the south end of town and somewhere past a mini-super cut over toward the beach. 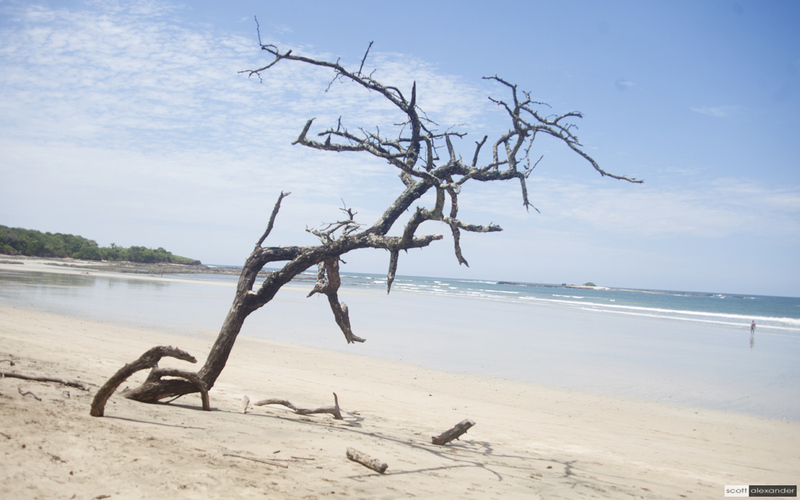 Playa Tamarindo is, without question, beautiful. And it’s massive. The day prior, we had debated walking around the bend but we were particularly lazy and it was no different on this day. We had simply come to relax. Coming upon the first beach-side bar we saw, we grabbed a couple of cervezas and plopped our tourist butts down in some wooden chairs in the shade. Sat. Talked. Laughed. Watched the waves roll in, the boats bob up and down in the ocean, and people mill about. Local vendors strolled around selling handcrafted items. Was getting the requisite beach vacation shots when a dog happened to come along and changed the whole dynamic. Which was awesome. The mariachi band from the night before showed up and serenaded a gaggle of women beside us. Then they walked over to us. Something peculiar about Priscila we both noticed during this trip was that Ticos everywhere seemed to be able to identify her as being Brazilian. And in this instance, her origins came up again. So Priscila and I sat and talked for a brief while with Julio Ricardo Ortiz, one of the men of Los Amigos del Norte. And as with everyone we met, Julio was truly a kind person. The foot traffic on the beach for a Tuesday afternoon was pretty substantial. Not enormous, but noticeable. Pro-tip: talking on your cellphone at the water’s edge is not how you do vacation. As the two of us sat, drinking our brunch away in this slice of paradise, we talked about the noticeably different vibe to this town. Priscila had traveled to Costa Rica the year prior for a surf vacation in Jacó and I, of course, had visited a few different spots around Costa Rica during my time here thus far. In comparing everywhere we had been, the name we heard locals use when referencing the town seemed accurate: Tamagringo. Infrastructure is the word people like to use when describing towns and their livability for gringos in Costa Rica. 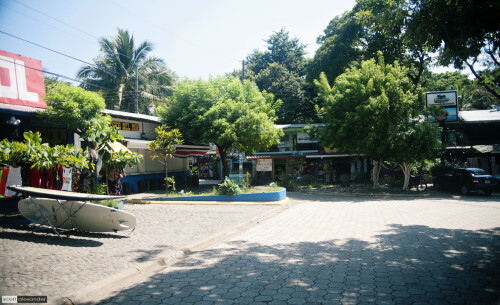 Tamarindo is one of those towns that has infrastructure, people say. In much the same way people say that about Jacó. Or San José. Or any major city in Costa Rica. And that’s perfectly great. Infrastructure is a good thing. What’s different about Tamarindo is that it feels more Americanized than any town that either of us had been to in this country. I mean, yes: this is Costa Rica. But even as we walked back into town, it’s hard not to notice the patterned concrete block street at the south end. The stylish, higher-end boutiques and restaurants. The appeal to American sensibilities in marketing language and imagery. The manicured woman with large sunglasses getting her morning energy drink from the juice bar. Not to mention the fact that gringos are everywhere you look. It’s as if Palm Beach (along with a couple of all-inclusive resorts from Jamaica) had been airlifted and dropped onto the coast here. None of this is bad per se. We enjoyed Tamarindo tremendously; the town, the beach, and everyone we encountered was lovely. 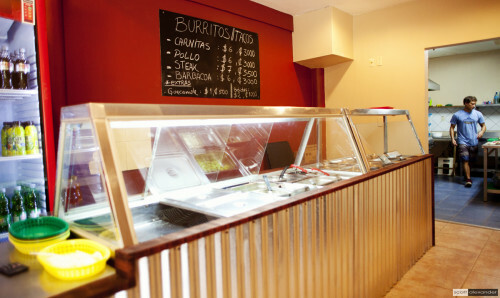 Every place has it’s own vibe and Tamarindo simply has a more American feel to it. At least, this was our impression and likely why it’s referred to as Tamagringo. About mid-afternoon, we headed back to the hotel and stopped to eat a late lunch at a small and newly opened Mexican grill called El Chilito. What happened next is that I had the best burrito of my life. Truthfully, I’ve never been a big lover of burritos but burritos and tacos were pretty much the entire menu. Kind of like the way In-And-Out Burger keeps their menu: short and scrumptious. Nick, the young owner of El Chilito, was without question one of the friendliest and most entertaining people we met throughout our travels. Moving to Tamarindo not that long ago, he’s one of those very laidback world-traveler types. It was while living in Spain that he developed an interest in cooking. Specifically, after going to the markets where there were all kinds of fruits and vegetables, he thought it would be a waste not to cook them. I was personally grateful for that life choice of his as the burrito was really just astounding. So if you’re in the area, you have to go to El Chillito both for the food and to meet Nick. Great food, great guy. Back at the hotel, a food coma ensued. We canceled the surf lessons and Priscila slept peacefully through her yoga class. After the sun set, we debated going out to a place called Fisch which has Salsa Night every Tuesday. In fact, much later in the evening, we could hear the music coming from it as our hotel was pretty close by. After tossing it about for a bit, we finally settled on staying in for the evening. We needed to get a good night’s rest anyway for our trip to Nosara. We still didn’t know where we would be staying but we had decided that a private taxi was the way to go. More on that next time. 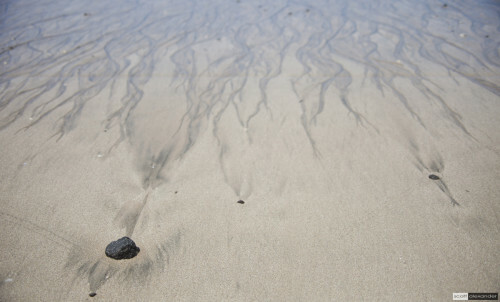 All of the photos from this portion of our trip can be found in the Tamarindo gallery on my site, helloimscott.com. About three years ago, I came to Costa Rica for the first time with my daughter, Sydney, and my fiancé, Cinde. We decided to try the Northern Pacific Coast first. Though we stayed at the very plush Westin Resort in Conchal, we continually found ourselves drawn to the small beach town of Tamarindo. We had the time of our lives on our vacation. There were so many things to do and all fairly close. As soon as we got back to the States it was clear that, though we had left Costa Rica, we were still influenced by its charm. Around this same time, I was in the process of selling the business that my father and I had run for many years. The three of us could not stop telling our friends and family about the incredible time we had down there. 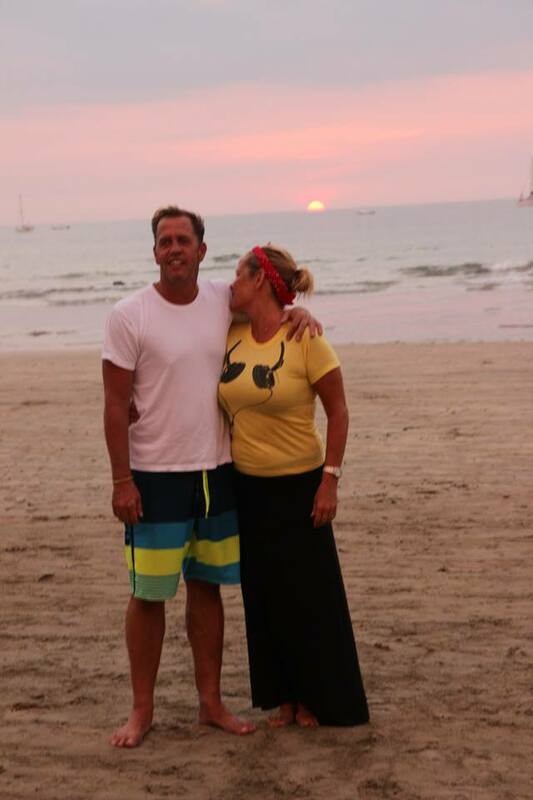 It wasn’t long before Cinde and I started discussing the idea of moving down to Costa Rica. Once my business sold, there would only be one thing preventing us from making the move. My daughter Sydney still had her senior year of high school to complete. I had no idea if she would even consider moving to another country at this point in her life. When I brought it up to her, she was as excited about it as Cinde and I were. Immediately, the planning began! We booked another trip back to Costa Rica to scout different areas and explore rental properties. The most important task was to find a reputable school where Syd could finish her last year of high school. 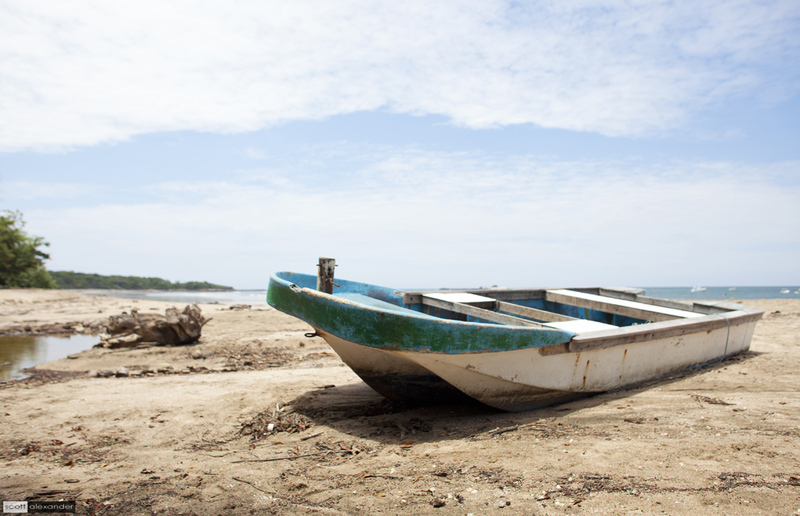 Naturally, we wanted to live in the Tamarindo area; the charming town had captured our hearts and imaginations. Back in the States, I asked Cinde how she felt about me putting in an offer on the hotel, just to see what happens. Her answer was an emphatic, “Yes!” Her enthusiasm and a few prophetic words from my dad were all I needed. 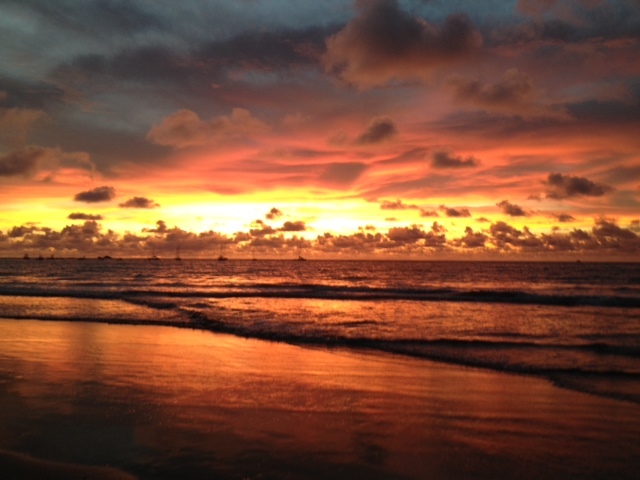 I was fortunate enough to come into contact with ABC Real Estate in Tamarindo. I was naturally very nervous about buying a property in a different country, but the ABC team quelled my anxiety and provided tremendous service during the transaction. My excitement only grew because of them and a few months later, I was the owner of a hotel in Paradise. We have put a lot of work into the hotel, but it has been the very definition of the phrase “A labor of love.” The last year and a half have been the most exciting and rewarding time of my life. What started as a two-week vacation has turned into the adventure of a lifetime. 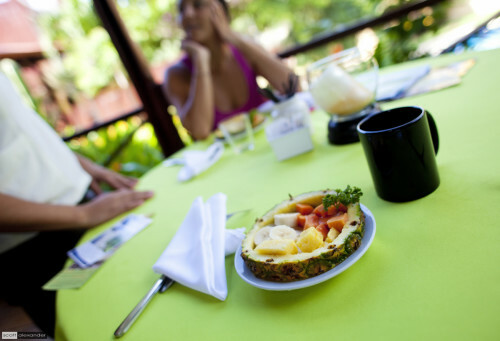 We have a saying at Villa Amarilla, “Come as strangers, leave as friends.” Please stop by to say hello if you are ever in Tamarindo.